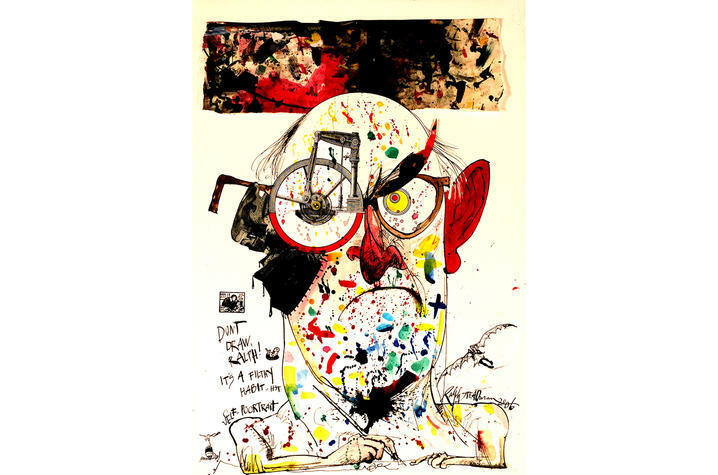 LEXINGTON, Ky. (Jan. 25, 2019) — From the pages of Hunter S. Thompson’s work and The New York Times to classics like “Alice in Wonderland” and “Animal Farm,” visual storyteller Ralph Steadman has made an undeniable mark on the world of illustration. 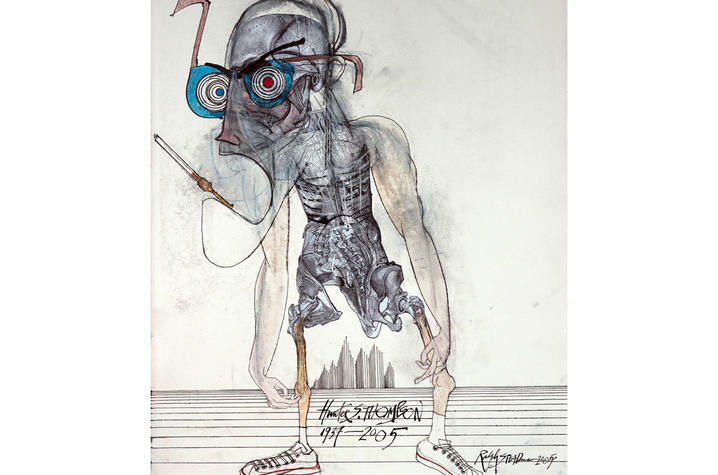 Art enthusiasts will be treated to an exhibition of works from the artist’s 65-year career as the University of Kentucky Art Museum brings “Ralph Steadman: A Retrospective” to the Bluegrass Feb. 16-May 5. 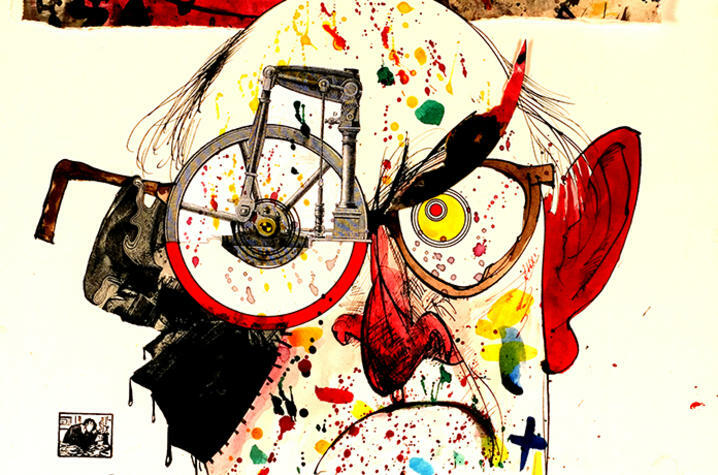 Combining expressive lines and emphatic ink splatters, Ralph Steadman’s work is an immediately recognizable style that has spanned decades. Featuring more than 100 original artworks and prints of Steadman’s, this retrospective examines the range of his projects in literature, theatre, television and product design. “With a sardonic eye, and the whip of his pen, Ralph Steadman challenges us to see the world in all its glory, grit, humor and beauty. Viewers of all ages will recognize his work, even if they don’t know his name,” UK Art Museum Director Stuart Horodner said. Originally curated in 2013 by Anita O'Brien at London's Cartoon Museum, and reorganized to travel throughout the U.S. by Sadie Williams, Ralph Steadman Art Collection executive director, the retrospective includes the sketches Steadman created as a student in the 1950s to present day drawings. Also on view are letters, press clippings and materials selected from the artist’s studio. Of note to Kentuckians and fans of gonzo journalism, this exhibition features work from Steadman’s legendary collaborations with maverick journalist Hunter S. Thompson, including work documenting the Kentucky Derby for an article in Scanlan Monthly in 1970. In addition to his illustrations for Thompson’s “Fear and Loathing in Las Vegas,” he also created pieces for Private Eye, Punch, The Observer, The Guardian and Rolling Stone, among others. It seems 2019 will truly be a gonzo year for the Commonwealth. In coordination with the exhibition at UK, the Frazier History Museum and the Speed art Museum in Louisville will be hosting exhibitions which look at different aspects of infamous journalist and Kentucky son, Hunter S. Thompson. “Ralph Steadman: A Retrospective” is made possible by presenting sponsors United Therapeutics, Flying Dog Brewery and Audible. The UK Art Museum, located in the Singletary Center for the Arts at Rose Street and Euclid Avenue, is open 10 a.m. to 5 p.m. Tuesday through Thursday, 10 a.m. to 8 p.m. Friday, and noon to 5 p.m. Saturday and Sunday. Admission is free but donations are encouraged. The mission of the UK Art Museum, part of the UK College of Fine Arts, is to promote the understanding and appreciation of art to enhance the quality of life for people of Kentucky through collecting, exhibiting, preserving and interpreting outstanding works of visual art from all cultures. Home to a collection of more than 4,800 objects including American and European paintings, drawings, photographs, prints and sculpture, the museum presents both special exhibitions and shows of work from its permanent collection.